Virginia Tech lost 71-77. 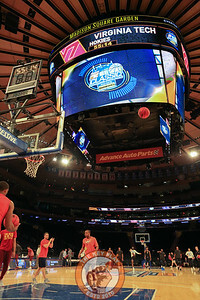 2K Classic, Madison Square Garden. Photos by: Chen Jiang. Virginia Tech and St. Louis players lunge for a loose ball during play in Madison Square Garde, Nov. 16, 2017. St. Louis upset Virginia Tech with a 77-71 win. 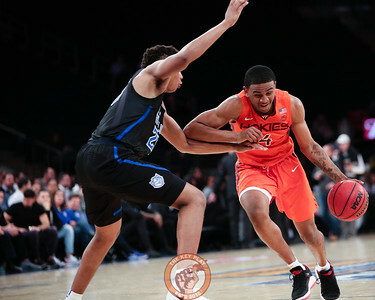 Virginia Tech's guard Nickeil Alexander-Walker (4) drives against a St. Louis defender in Madison Square Garde, Nov. 16, 2017. St. Louis upset Virginia Tech with a 77-71 win. Virginia Tech's guard Nickeil Alexander-Walker (4) ducks around St. Louis' guard Davell Roby (5) in Madison Square Garde, Nov. 16, 2017. St. Louis upset Virginia Tech with a 77-71 win. 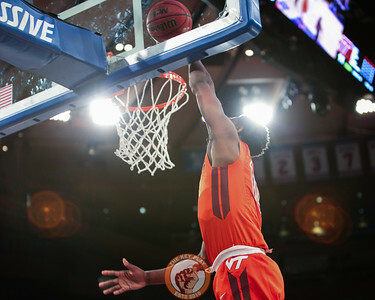 Virginia Tech's guard Justin Bibbs (10) dunks against St. Louis in Madison Square Garde, Nov. 16, 2017. St. Louis upset Virginia Tech with a 77-71 win. 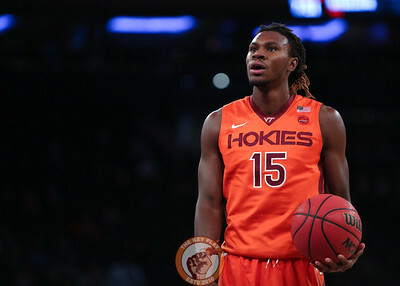 Virginia Tech's forward Chris Clarke (15) pauses before a free throw against St. Louis in Madison Square Garde, Nov. 16, 2017. St. Louis upset Virginia Tech with a 77-71 win. Virginia Tech's guard Justin Robinson (5) dodges between St. Louis' forward Jalen Johnson (20) and forward Hasahn French (22) in Madison Square Garde, Nov. 16, 2017. St. Louis upset Virginia Tech with a 77-71 win. Virginia Tech's guard Ahmed Hill (13) dribbles around St. Louis' guard Jordan Goodwin (0) in Madison Square Garde, Nov. 16, 2017. St. Louis upset Virginia Tech with a 77-71 win. Virginia Tech's guard Nickeil Alexander-Walker (4) drives around St. Louis' forward Jalen Johnson (20) in Madison Square Garde, Nov. 16, 2017. St. Louis upset Virginia Tech with a 77-71 win. 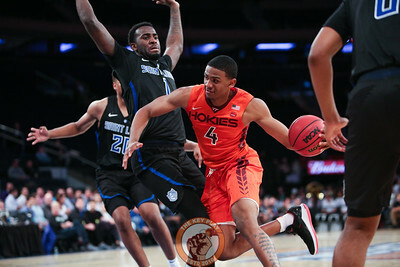 Virginia Tech's guard Nickeil Alexander-Walker (4) drives around St. Louis' forward D.J. Foreman (1) in Madison Square Garde, Nov. 16, 2017. St. Louis upset Virginia Tech with a 77-71 win. Virginia Tech's guard Justin Robinson (5) goes for a lay up over St. Louis' forward Hasahn French (22) in Madison Square Garde, Nov. 16, 2017. St. Louis upset Virginia Tech with a 77-71 win. 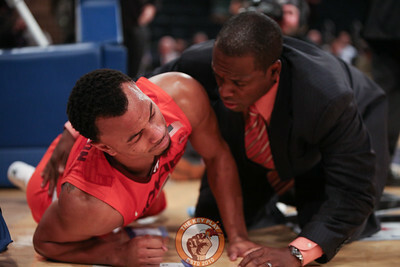 Virginia Tech's guard Justin Robinson (5) lays on the court injured during play against St. Louis in Madison Square Garde, Nov. 16, 2017. St. Louis upset Virginia Tech with a 77-71 win. 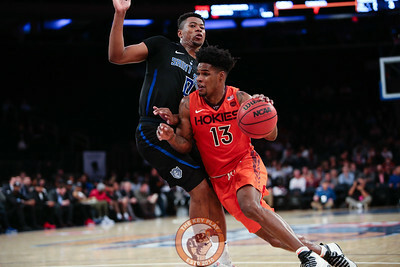 Virginia Tech's guard Ahmed Hill (13) loses control of the ball during play against St. Louis in Madison Square Garde, Nov. 16, 2017. St. Louis upset Virginia Tech with a 77-71 win. 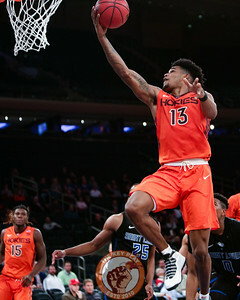 Virginia Tech's guard Ahmed Hill (13) goes for a lay up against St. Louis in Madison Square Garde, Nov. 16, 2017. St. Louis upset Virginia Tech with a 77-71 win. Virginia Tech's guard Justin Robinson (5) splits two St. Louis defenders for a layup in Madison Square Garde, Nov. 16, 2017. St. Louis upset Virginia Tech with a 77-71 win. 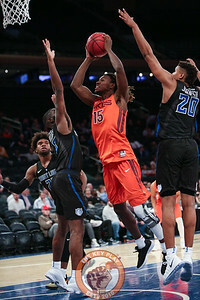 Virginia Tech's forward Chris Clarke (15) shoots over St. Louis' forward D.J. Foreman (1) in Madison Square Garde, Nov. 16, 2017. St. Louis upset Virginia Tech with a 77-71 win. 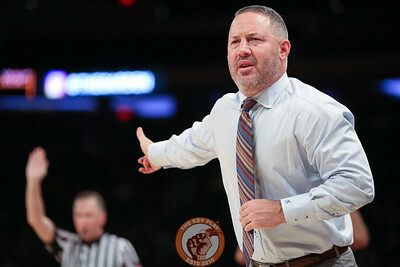 Virginia Tech head coach Buzz Williams reacts during play against St. Louis in Madison Square Garde, Nov. 16, 2017. St. Louis upset Virginia Tech with a 77-71 win. Virginia Tech's guard Nickeil Alexander-Walker (4) and guard Justin Bibbs (10) grab a rebound over St. Louis' guard Davell Roby (5) in Madison Square Garde, Nov. 16, 2017. St. Louis upset Virginia Tech with a 77-71 win. 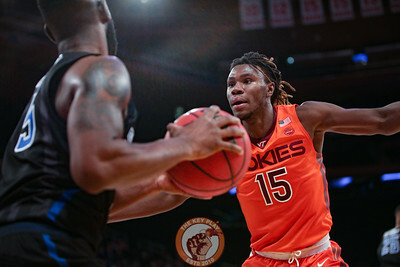 Virginia Tech's forward Chris Clarke (15) defends a throw in by St. Louis' guard Davell Roby (5) in Madison Square Garde, Nov. 16, 2017. St. Louis upset Virginia Tech with a 77-71 win. Players and coaches warm up before play against St. Louis in Madison Square Garde, Nov. 16, 2017. St. Louis upset Virginia Tech with a 77-71 win. 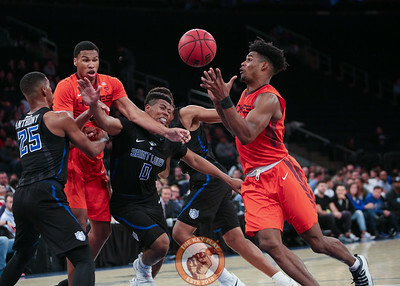 Virginia Tech's guard Nickeil Alexander-Walker (4) is defended heavily by St. Louis' forward Jalen Johnson (20) and forward Hasahn French (22) in Madison Square Garde, Nov. 16, 2017. St. Louis upset Virginia Tech with a 77-71 win. St. Louis' Javon Bess (3) shoots over Virginia Tech's forward Kerry Blackshear Jr. (24) in Madison Square Garde, Nov. 16, 2017. St. Louis upset Virginia Tech with a 77-71 win. 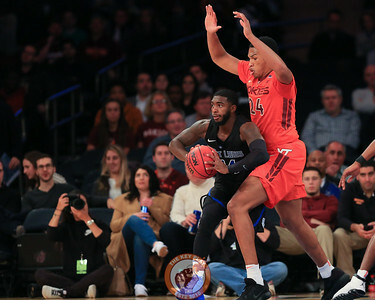 Virginia Tech's forward Kerry Blackshear Jr. (24) defends St. Louis' guard Aaron Hines (24) in Madison Square Garde, Nov. 16, 2017. St. Louis upset Virginia Tech with a 77-71 win. 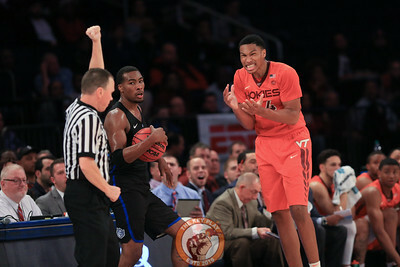 Virginia Tech's forward Kerry Blackshear Jr. (24) reacts during play agains St. Louis in Madison Square Garde, Nov. 16, 2017. St. Louis upset Virginia Tech with a 77-71 win. 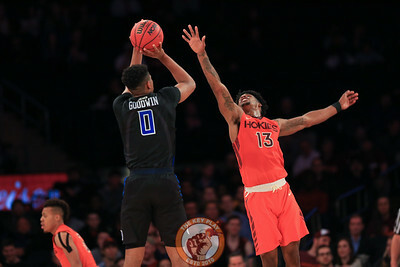 Virginia Tech's guard Ahmed Hill (13) defends a shot from St. Louis' guard Jordan Goodwin (0) in Madison Square Garde, Nov. 16, 2017. St. Louis upset Virginia Tech with a 77-71 win. 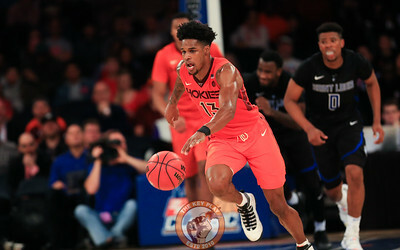 Virginia Tech's guard Ahmed Hill (13) dribbles up court against St. Louis in Madison Square Garde, Nov. 16, 2017. St. Louis upset Virginia Tech with a 77-71 win. 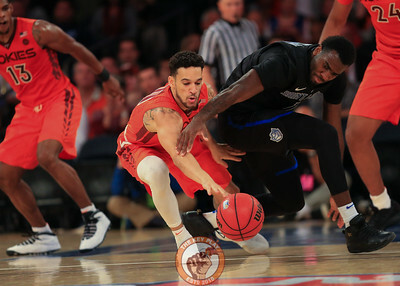 Virginia Tech's guard Devin Wilson (11) and St. Louis' guard Jordan Goodwin (0) fight for a loose ball in Madison Square Garde, Nov. 16, 2017. St. Louis upset Virginia Tech with a 77-71 win. 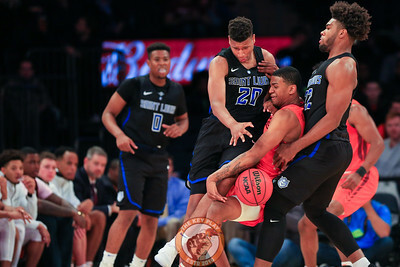 Virginia Tech's forward Kerry Blackshear Jr. (24), guard Ahmed Hill (13), guard Devin Wilson (11) and St. Louis' guard Jordan Goodwin (0) fight for a loose ball in Madison Square Garde, Nov. 16, 2017. St. Louis upset Virginia Tech with a 77-71 win.